The first step is to write down a plan of what events you will be hosting for the holiday season. Is it your turn to host Christmas dinner for the family? Are you having any Christmas parties or perhaps a big bash for New Year’s Eve? If so, start planning now and keep a list of what needs to be done. Don’t forget to include the linen washing and cleaning the silver that will need to happen. For the entire house (or you can focus on the areas that guests will see), eliminate clutter. Get rid of old magazines, and find a place for those knick-knacks that aren’t holiday themed. You can box them up until after the holidays and store them in the attic or garage. Divide and conquer. Make up a list of jobs to be done and assign the chores to family members. You may want to clean the carpets, paint a room or you may even have some larger tasks that you will pay a professional to complete. Work those into your plan and get them scheduled early. The closer it gets to the holidays, the harder it will be to get these bigger jobs completed. Get out your holiday decorations. Check for completeness, burnt out bulbs, and broken displays. Repair or replace as necessary. Clean items that are dirty. Fill in with any new purchases and set aside until you are ready to decorate. Start picking up or borrowing any items you may need for entertaining. Linens and serving pieces can be expensive so try to borrow them from family or friends. Purchase non-perishable foods and store it until your party. Don’t forget to purchase coffee, tea, pop and/or alcohol. Pick a couple of weekends to decorate. Enlist the whole family to help and make it fun. Maybe have a pizza night or some special meal. Even your children can help with unwrapping ornaments and decorating the tree. If you have a live or fresh cut tree, assign one of the kids to water it daily. Take any pets or small children into account when decorating. If you are going to have overnight guests, prepare your guest room. Vacuum and clean the room well. Change the bedsheets and wash the bedspread, if necessary. Add a small holiday decoration to a table along with a basket of toiletries. Make the guest room inviting instead of the place where you fold laundry every week. Make sure your guest has clean towels and their bathroom should sparkle. The biggest point to remember: your guests are coming to see you and your family not how you decorate. Keep your home comfortable for you and your guests with clutter picked up and floors cleaned. Take time to enjoy the holidays and don’t stress over what doesn’t get done. Your guests probably won’t even notice! 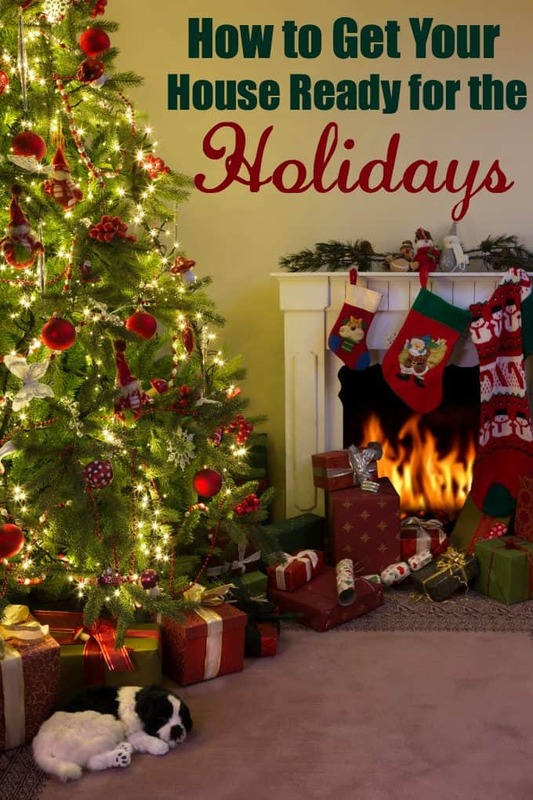 What do you do to get your house holiday-ready? Join the #MGAHoliday Twitter Party on November 23rd! Great tips. I never seem to be that organized with my holiday preparations! Great tips, can’t believe it is that time of year already. It sure snuck up this year! All great tips! I’m itching to start decorating! Trying to hold off until at least the last weekend of Nov. Need to start preparing now… it’s creeping up!